Neanderthals are known to have lived in the Levant. Agriculture began in the area during this time period. After the Yarmukians (starting of stone age) came the Ghassulians. People became urbanized and lived in city-states, including Jericho; those were some of the world's earliest known cities. This era is divided into two parts; Early Canaanite Period (Early Bronze Age; 3300 - 2300 BCE). There is cultural continuity within the local Semitic-speaking culture from the previous Chalcolithic Period, but now also intermingling with outside influences. Later part is known as the Middle Canaanite Period and Israelite Period (Middle Bronze Age; 2300-1000 BCE). Successive waves of migration brought other groups onto the scene. Around 1200 BCE the Hittite empire was conquered by allied tribes from the north. The Phoenicians of Lebanon, were temporarily displaced, but returned when the invading tribes showed no inclination to settle. The Egyptians called the horde that swept across Asia Minor and the Mediterranean Sea the Sea Peoples. The Philistines (whose traces disappear before the 5th century BCE) are presently considered to have been among them, giving the name Philistia to the region in which they settled, located in present-day Gaza. During this time, the Israelites emerged in the area. This period is also known as the Period of Judges. In c. 1250, exodus of the Hebrew people out of Egypt was led by Moses. Hebrew conquest of Canaan (Palestine) occured in c. 1200. With the exception of Moses ben Amram (Levi tribe), Joshua ben Nun (Ephraim tribe) and Samuel ben Elkana (Levi tribe), none of the judges had control over all the tribes as such. Rather, each judge exercised authority over his or her own tribe, occasionally uniting with a few neighboring tribes in the interest of common defense. Eventually the people demanded a king and a regular army to defend them from foreign invaders. Samuel, a staunch advocate of the tribal confederacy, warned them of the pitfalls of monarchy, but they insisted, and he reluctantly anointed first Saul, and then David, King of Israel. The Israelites dwelt in tribes amongst the other local inhabitants until the installment of King Saul in 1025 BCE. Serveral small Kingdoms were established like Kingdom of Judah, Kingdom of Israel, Philistine city-states, Phoenician states, Kingdom of Ammon, Kingdom of Edom, Kingdom of Aram-Damascus, Aramean tribes, Arubu tribes, Nabatu tribes, Assyrian Empire and Kingdom of Moab. Roman established Province of Iudaea. It was on the coast known as the province of Philistia (now Gaza strip), which the Greeks called Palaistina and the Romans Palaestina. According to the Bible, King David (c. 1010 - 961) and King Solomon (961 - 922) reigned and built the First Temple in Jerusalem. Divided Monarchies of Judah and Israel, Moab, Amon, and Philistia (Iron Age IIB) started in 925–722 BC. The Bible says that with the death of King Solomon around 925 BCE, the Israelites fell into civil war, and the kingdom split into the northern Kingdom of Israel and the southern Kingdom of Judah. The northern kingdom was far more wealthy and politically influential, but its monarchy was unstable with frequent intrigue and dynastic changes. In the relative backwaters of the southern Kingdom of Judah, the Davidic Dynasty alone ruled Judah and its vicinities for centuries until the Persian Period, proving remarkably stable. Several factors contributed to the stability of the southern monarchy. Its kings made a frequent practice of ruling alongside a son in a period of coregency. Gradually, the kings centralized all religious authority to Jerusalem the capital city: to the Temple located next to the king's palace. Unlike El that was perceived as a universal deity in the north, YHWH was perceived in the south as a patron deity of the nation of Israel, thus worship of other gods equated to treason. Throughout the Davidic Dynasty of the Kingdom of Judah, religious loyalty and loyalty to the king consolidated. Monarchy of Judah and Edom/Neo-Assyrian Period (Iron Age IIC) started in 722–586 BCE. In 722 BCE, the northern Kingdom of Israel was destroyed by the Assyrians, many of its inhabitants (mainly the elite amongst them) were deported (giving rise to the legend of "the Lost Tribes") and replaced by settlers from elsewhere in the Assyrian Empire. Many, however, probably fled to their southern Israelite sister kingdom of Judah, but others most likely stayed behind. Philistine cities, because of their strategic location close to Egypt, were ruled directly by a governor appointed by the Assyrians. In Edom, a series of kings was founded under Assyrian patronage, to keep the Judean kingdom distracted to the south. A number of anti-Edomite passages in the Bible are dated to this period. This period is known as Neo-Babylonian Period (Iron Agee III). The Babylonian Empire under Nebuchadnezzar conquered the (southern) Kingdom of Judah in 604–587 BCE, and exiled the middle and upper classes of the Jews (that is, the citizens of the Kingdom of Judah, consisting mostly of the members of the tribe of Judah but also some members of the other tribes) to Babylonia, where they flourished. Most regard the collapse of the Israelite kingdoms as the beginning of the Jewish diaspora. Cyrus II of Persia conquered the Babylonian Empire by 539 BCE and incorporated Judah and Israel into the Persian Empire. Cyrus organized the empire into provincial administrations called satrapies. The administrators of these provinces, called satraps, had considerable independence from the emperor. The Persians allowed Jews to return to the regions that the Babylonians had exiled them from, rebuild the Temple and mint Yehud coins. The exiled Jews who returned encountered the Jews that had remained, surrounded by a much larger non-Jewish majority. One group of note (that exists up until this day) were the Samaritans, who adhered to most features of the Jewish rite and claimed to be descendants of the Assyrian Jews; they were not recognized as Jews by the returning exiles for various reasons (at least some of which seem to be political). The return of the exiles from Babylon reinforced the Jewish population, which gradually became more dominant and expanded significantly. The region was visited c. 450 BCE by Herodotus whose writings give the first known usage of the name "Syria Palaestina." In the early 330s BCE, Alexander the Great conquered the region, beginning an important period of Hellenistic influence in the country. Later this land was called Palestine by the Roman emperor Hadrian. After Alexander's death in 323 BCE, his empire was partitioned, and the armies of Ptolemaic Egypt and the Seleucid Empire of Syria battled for control of various portions of the eastern Mediterranean, in the areas of southern Syria, Lebanon and Israel of today. The Seleucid and Ptolemaic dynasties called that region Coele-Syria and Phoenicia. Antiochus the Great of Syria gained victory over Scopas in a decisive battle at Banias in 201-202 BCE. Scopas and his army fled to Sidon where the Seleucid forces held them under siege until they surrendered in 199 BCE. By 198 BCE, all of Coele-Syria and Phoenicia lay under the rule of Antiochus. It was in the time of Alexander that Aristotle called the homeland of the Jews IOUDAIA, and their city Hierusaleme, as reported by Aristotle's disciple, Clearchos of Soli, in his work, On Sleep. The Greek name IOUDAIA became IVDAEA in Latin. However, the source for this name appears to be the Aramaic word Yehoudaya יהודאיא meaning The Jews. This is the opinion of the highly respected French scholar Felix Abel, of the Dominican Ecole Biblique in Jerusalem. Judea is simply the English version of IVDAEA, also given as Judaea. Under Seleucid rule after Antiochus' conquest, IOUDAIA was a division of Coele-Syria. Maccabean revolt occurred in 167 and Jews restore their sovereignty in Judea and the extent of the Hasmonaean Dynasty as Maccabean Kingdom. According to the Books of Maccabe which first appear in history in the Septuagint the Judeans were divided between the advanced Hellenists who supported the adoption of Greek culture, and those who believed in keeping to the traditions of the past, which resulted in the Maccabean revolt of the 2nd century BCE. The Kingdom of Judea controlled most of the region of present-day Israel (without the Negev but with the West Bank, Golan Heights, and parts of the Gaza Strip) and parts of western Jordan. Demetrius I Soter suppressed the revolt in 160 BC but Maccabean Kingdom continued under vassalage of Seleucid Empire until 64 BC. Following the Roman conquest of Syria in 63 BCE, parts of Israel. From 37 BCE to 4 CE it became a client kingdom of the Roman Empire under Herod I, then the Iudaea Prefecture of Syria Province, revolted against Roman occupation (Zealots and Jewish-Roman Wars). The Great Jewish Revolt began in 66 CE and resulted in the destruction of Jewish temple in Jerusalem in 70 CE and the sacking of the entire city by the Roman army led by Titus Flavius and the estimated death toll of 600,000 to 1,300,000 Jews. In short Galilee retaken in 67, Judaea and Idumaea retaken in 68, Jerusalem and the Temple destroyed in 70 and Masada taken in 73. Rabbi Yokhanan ben Zakai, a student of Hillel, fled during the siege of Jerusalem to negotiate with the Roman General Vespasian, who he predicted would soon become emperor. Yokhanan obtained permission to reestablish a Sanhedrin in the coastal city of Iamnia (modern Yavne; Council of Jamnia). He founded a school of Torah there that would eventually evolve, through the Mishna in around 200 CE, into Rabbinic Judaism. In 106 CE The Nabatean territory was incorporated it into the Roman province of Arabia. Romans join the province of Iudaea (comprising Samaria, Judea proper, and Idumea) with Galilee to form new province of Syria Palaestina. In 135 CE, the victory in Bar Kokhba's revolt by Hadrian resulted in 580,000 Jews killed (according to Cassius Dio) and destabilization of the region's Jewish population. The Romans renamed the new territory Syria Palaestina to complete the disassociation with Judaea. Jerusalem is re-established as the Roman military colony of Aelia Capitolina; a largely unsuccessful attempt is made to prevent Jews from living there. Many Jews left the country altogether for the Diaspora communities, and large numbers of prisoners of war are sold as slaves throughout the Empire. A number of events with far-reaching consequences took place, including religious schisms, such as Christianity branching off of Judaism. The Romans destroyed the Jewish community of the Mother Church in Jerusalem, which had existed since the time of Jesus. The line of Jewish bishops in Jerusalem, which started with Jesus's brother James the Righteous as its first bishop, ceased to exist, within the Empire. Hans Kung in "Islam: Past Present and Future", suggests that the Jewish Christians sought refuge in Arabia and he quotes with approval C. Clemen, T. Andrae and H.H. Schraeder, p. 342 "This produces the paradox of truly historic significance that while Jewish Christianity was swallowed up in the Christian church, it preserved itself in Islam, and some of its most powerful impulses extend down to the present day". Rabbi Yehuda Ha-Nasi finalized the Mishna and Amoraic Period (220-470 CE) begins. The use of Hebrew as the spoken language gradually declines in the aftermath of the Bar Kokhba Revolt, becoming negligible approximately 300 CE but surviving as a literary language. During the Byzantine Period, the Jewish population in the north of Israel remained large for several centuries, particularly in Eastern Galilee. Western Galilee later began to take on a more Christian character i.e. Syro-Arameans, Greeks and Romans from the 5th century onward. The coastal plain, central Judea and Southern Samaria had already become largely Pagan. Southern Judea remained mostly Jewish for some centuries and Northern Samaria remained Samaritan until the later stages the first period of Islamic imperial rule. Jewish tribes also settled as nomadic pastoralists in Arabia, particularly around Yathrib (later Medina). Byzantines revert to the name Palestine first used by Herodotus c. mid 5th c. BCE and reinstituted by the Emperor Hadrian, in the form Syria Palaestina circa 135 BCE. The Land of Palestine became part of the Eastern Roman Empire ("Byzantium") after the division of the Roman Empire into east and west (a fitful process that was not finalized until 395 CE). Around 390 CE, the Byzantines redrew the borders of the Land of Palestine. The various Roman provinces (Syria Palaestina, Samaria, Galilee and Peraea) were reorganized into three diocese of Palaestina. According to historian H.H. Ben-Sasson, under Diocletian (284-305) the region was divided into Palaestina Prima which was Judea, Samaria, Idumea, Peraea and the coastal plain with Caesarea as capital, Palaestina Secunda which was Galilee, Decapolis, Golan with Beth-shean as capital, and Palaestina Tertia which was the Negev with Petra as capital. In 351 CE, the Jews launched another revolt, provoking heavy retribution. In 438 CE, Empress Eudocia allows Jews to return to Jerusalem to live. The Nabateans roamed the Negev by the Roman Period, and by the Byzantine Period dominated the swath of sparsely populated deserts, from the Sinai to the Negev to the northwest coast of Arabia, the outlands that the Byzantines called the diocese of Palaestina Salutoris (meaning something like "near Palestine"). Its capital Petra was formally the capital of the Roman province of Arabia Petraea. The Nabateans also inhabited the outland of Jordan and southern Syria, improperly called the diocese of Arabia because its capital Bostra was within the northern extremity of the Roman province of Arabia Petrae. The origin of the Nabateans remains obscure, but they were Aramaic speakers, and the term "Nabatean" was the Arabic name for an Aramean of Syria and Iraq. By the third century during the Late Roman Period, the Nabateans stopped writing in Aramaic and began writing in Greek, and by the Byzantine Period they converted to Christianity. The two diocese of Palaestina proper also became increasingly Christianized. The Christian monk, Bar-Şawmā, in the 5th century, records that Jews and heathens formed the majority of the population. The Jews and Samaritans who ruled the country persecuted Christians. Some areas, like Gaza, were well-known as pagan holdouts, and remained attached to the worship of Dagon and other deities as their ancestors had been for thousands of years. Under Byzantine rule, the region became a center of Christianity, while retaining significant Jewish and Samaritan communities (although the Samaritans were greatly reduced following Julianus ben Sabar's revolt). In 613 CE, the Persian Sassanian Empire under Khosrau II invaded Palaestina. Jews under Benjamin of Tiberias assisted the conquering Persians, revolting against the Byzantine Empire under Heraclius in the hopes of controlling Jerusalem autonomously. In 614 CE, the Persians conquered Jerusalem, destroying most of the churches and expelling 37,000 Christians. The Jews of Jerusalem gained autonomy to some degree, but frustrated with its limitations and anticipating its loss offered to assist the Byzantines in return for amnesty for the revolt. In 617 CE, the Persians signed a peace treaty with Byzantines. At that time the Persians betrayed the agreements with the Jews and expelled the Jewish population from Jerusalem, forbidding them to live within 3 miles of it. In 625 CE, the Byzantine army returned to the area, promising amnesty to Jews who had joined the Persians, and was greeted by Benjamin of Tiberias. In 628 CE, the Byzantine Emperor Heraclius marched into Jerusalem at the head of his army with the support of the Jewish population who had received amnesty. Nevertheless, upon entry, the Christian priests in Jerusalem convinced the emperor that God commanded him to kill Jews and therefore his amnesty was invalid, whereupon the Byzantines massacred the Jews in Jerusalem and put thousands of Jewish refugees to flight from Palaestina to Egypt. In 634 CE, the Byzantine Empire lost control of the entire Mideast. The Arab Islamic Empire under Caliph Umar conquered Jerusalem along with the lands of Mesopotamia, Syria, Palaestina, and Egypt. In 638 CE, the Christians of Jerusalem surrendered to the conquering armies of the Caliphate (Islamic Empire) under Caliph (Emperor) Umar, the second of the initial four Rashideen Caliphs. Umar entered captured Jerusalem on foot. Umar allowed seventy families from Tiberias in Galilee to move to Jerusalem to live. Christians, who were expelled from Arabia by Umar also moved to Palestine. In Arabic, the area approximating the Byzantine Diocese of Palaestina I in the south (roughly Judea, Philistia, and southern Jordan) was called Jund Filastin (meaning Division of Palestine, as a tax administrative area), and the Diocese of Palaestina II in the north (roughly Samaria, Galilee, Golan, and northern Jordan) Jund al-Urdunn. In 661 CE, with the assassination of Ali, the last of the Rashidun Caliphs, Muawiyah I became the uncontested Caliph and founded the Ummayad Dynasty at Damascus. After the Arabs conquered the area, waves of Bedouin garrisons began to settle there. Crusader Period started from 1099 to 1244. The proximate cause of the Crusades, following 1095, by the Christian European powers was the desire to reconquer the birth place of Christianity, which had been lost to the Islamic Arab invasion of the Eastern Roman Empire in the 7th century. The Christian forces established the Kingdom of Jerusalem, which lasted from 1099 until 1291, though Saladin reconquered the city of Jerusalem in 1187. After the fall of Jerusalem in 1187, the Christian Crusader Kingdom (15 Jul 1099 - 31 Jul 1291) survived throughout the Ayyubid Period until 1291 (fall of Jerusalem 23 Aug 1244, Acre 16 May 1291, Haifa 30 Jul 1291, Sidon 14 Jul 1291, and Beirut 31 Jul 1291) well into the Mamluk Period. al-Nasir Salah ad-Din Yusuf (Saladin) was Governor in Egypt for the ephemeral Zangid hegemony established at the final collapse of Fatamid aspirations. Saladin quickly threw off nominal Mesopotamian rule to become the de jure as well as de facto ruler of the Nile and established the Ayyubid Sultanate. He controlled Jerusalem (02 Oct 1187 - 18 Feb 1229) and some but not all of the region until 1250, when it was defeated by the Mamluk Sultanate of Egypt. After the Mongols decimated Baghdad and Damascus in the mid-1200s, the center of Islamic power moved to Cairo, under the Egyptian slave warriors, the Mamluks. They destroyed all towns on the flat coastal plains in order to rid the land of the Crusader presence and make sure it never returned. The main exceptions were Jaffa, Gaza, Lydda and Ramle. The last major Crusader stronghold, Acre fell in 1291, at the Siege of Acre. As a result of this, most trade with the west was curtailed. In the late 1200s, Palestine and Syria were the primary front for battles between the Egyptian Mamluks and the Mongol Empire. The pivotal battle was the Battle of Ain Jalut in 1260, when the Mamluks, after having brokered a cautious neutrality with the Crusaders (who regarded the Mongols as a greater threat), were able to advance northwards and achieve a decisive victory over the Mongols at Ain Jalut, near Galilee. The Mongols were, however, able to engage into some brief Mongol raids into Palestine in 1260 and 1300, reaching as far as Gaza. Due to the many earthquakes, the religious extremism and the black plague that hit during this era, the population dwindled to around 200,000. It is during this period that the land began to have a Levantine Muslim majority and even in the traditional Jewish stronghold of Eastern Galilee, a new Jewish-Muslim culture began to develop. The Mamluk Sultanate ultimately became a vassal state of the Ottoman Empire, in the wake of campaigns waged by Selim I in the 16th century. In 1516 the Ottoman Turks occupied Palestine. It became part of the Ottoman Empire on 23 Aug 1516, of the viyalet (province) of Damascus-Syria (Jerusalem occupied 28 Dec 1516). The country became part of the Ottoman Empire. Constantinople appointed local governors. Public works, including the city walls, were rebuilt in Jerusalem by Suleiman the Magnificent in 1537. An area around Tiberias was given to Don Joseph HaNasi for a Jewish enclave. Following the expulsions from Spain, the Jewish population of Palestine rose to around 25% (includes non-Ottoman citizens, excludes Bedouin) and regained its former stronghold of Eastern Galilee. That ended in 1660 when they were massacred at Safed and Jerusalem. Palestine became part of the viyalet of Sa`ida (in Lebanon). During the reign of Dahar al Omar, Pasha of the Galilee, Jews from Ukraine began to resettle Tiberias. Napoleon of France briefly waged war against the Ottoman Empire (allied then with Great Britain). His forces conquered and occupied cities (Jaffa, Haifa, and Caesarea) in Palestine from 07 Mar 1799 to Jul 1799. French forces were finally defeated and driven out by 1801. In 1799 Napoleon announced a plan to re-establish a Jewish State in Palestine which was mostly to curry favour with Haim Farkhi the Jewish finance minister and adviser to the Pasha of Syria/Palestine. He was later assassinated and his brothers formed an army with Ottoman permission to conquer the Galilee. Palestine was annexed by Egypt (remains nominally Ottoman) from 10 May 1832 to Nov 1840. Many Egyptians soldiers settled there. Turkish rule lasted until World War I. Jewish immigration to Palestine, particularly to the "four sacred cities" (Jerusalem, Safed, Tiberias and Hebron) which already had significant Jewish communities, increased particularly towards the end of Ottoman rule; Jews of European origin lived mostly on charity while many Sephardic Jews found themselves a trade. Many Circassians and Bosnian Muslims were settled in the north of Palestine by the Ottomans in the early 19th Century. However, with the advent of early Zionism, just prior to the outbreak of World War I in 1914, the Jews had become a small majority in the central Judea region. Many were not Ottoman citizens and were expelled to Egypt at the time that war was declared. On 02 Nov 1917, Balfour Declaration: Britain views favorably the creation of a Jewish state in Palestine. Jerusalam was captured on 09 Dec 1917 and by 26 Sep 1918 British occupied the complete Palestine. Some important dates in Palestine history. 23 Aug 1516 Palestine part of the Ottoman Empire. 09 Dec 1917 British capture Jerusalem. 26 Sep 1918 British occupation (Palestine). 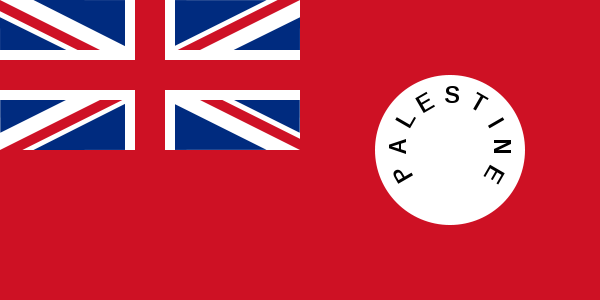 14 Jul 1922 Palestine League of Nations mandate under Britain. 29 Sep 1923 League of Nations mandate (Effective). West Bank under Jordan, Gaza under Egyptian administration. by Feb 1949, formally abolished 1952. (and later by over 100 states). 31 Jul 1988 Jordan abandons claims to West Bank. Palestinian state on West Bank and Gaza Strip (to no effect). 09 Dec 1988 UN Right to circulate communications without intermediary. 15 Dec 1988 UN designation "Palestine"
itself, Israel, United States and Russia. 21 Dec 1995, Ramallah 27 Dec 1995, 80% of Hebron 17 Jan 1997). 12 Mar 2002 - 23 Mar 2002 Israeli forces occupy Palestinian Authority areas. 29 Mar 2002 - 10 May 2002 Israeli forces occupy Palestinian Authority areas. 12 Sep 2005 Israel withdraws settlements from the Gaza Strip. 14 Jun 2007 - date Hamas forces seize control of the Gaza Strip. 29 Nov 2012 UN observer state status granted. 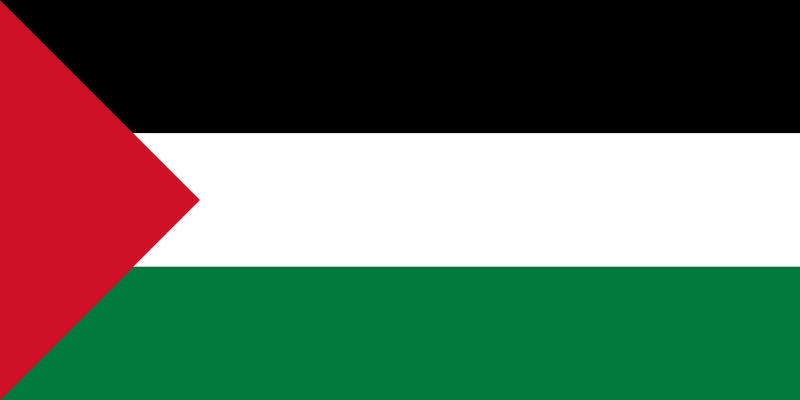 06 Jan 2013 Palestinian Authority renamed State of Palestine. Palestine and Transjordan were incorporated (under different legal and administrative arrangements) into the Mandate for Palestine, issued by the League of Nations to Great Britain on 29 September 1923. The rise of Zionism, the national movement of the Jewish people started in Europe in the 19th century seeking to create a Jewish state in Palestine. By 1920, the Jewish population of Palestine had reached 8% of the population (Ottoman citizens only, including Bedouin and Transjordan). In World War I, Turkey sided with Germany. As a result, it was embroiled in a conflict with Great Britain, leading to the British capture of Palestine in a series of battles led by General Allenby. Allenby dismounted from his horse when he entered captured Jerusalem as a mark of respect for the Holy City. He was greeted by the Christian, Jewish, and Islamic leaders of the city with great honor. At the subsequent 1919 Paris Peace Conference and Treaty of Versailles, Turkey's loss of its Middle East empire was formalized. The British had in the interim made two agreements. In the Hussein-McMahon Correspondence there was an undertaking to form an Arab state in exchange for the Great Arab Revolt and in the Balfour Declaration in 1917 to "favour the establishment in Palestine of a national home for the Jewish people while respecting the rights of existing non-Jewish communities". The Faisal-Weizmann Agreement of the same epoch declared the compatibility of Jewish and Arab nationalist aspirations. McMahon's promises could have been seen by Arab nationalists as a pledge of immediate Arab independence, an undertaking violated by the region's subsequent partition into British and French League of Nations mandates under the secret Sykes-Picot Agreement of May 1916 which became the real cornerstone of the geopolitics structuring the entire region. The Balfour Declaration, likewise, was seen by Jewish nationalists as the cornerstone of a future Jewish homeland on both sides of the Jordan River. Prior to the conference Emir Faisal, British ally and son of the king of the Hijaz, had agreed in the Faisal-Weizmann Agreement to support the immigration of Jews into Palestine and the creation of a Jewish state in Palestine, while creating a large Arab state based in Syria. When the conference did not produce that Arab state, and under pressure from Islamists, Faisal called instead for Palestine to become part of his new Arab Syrian kingdom. In 1920, the Allied Supreme Council meeting at San Remo offered a Mandate for Palestine to Great Britain, but the borders and terms under which the mandate was to be held were not finalised until September 1922. Article 25 of the mandate specified that the eastern area (then known as Transjordan or Transjordania) did not have to be subject to all parts of the Mandate, notably the provisions regarding a Jewish national home. This was used by the British as one rationale to establish an Arab state, which it saw as at least partially fulfilling the undertakings in the Hussein-McMahon Correspondence. On 11 April 1921 the British passed administration of the eastern region to the Hashemite Arab dynasty from the Hejaz what later became part of Saudi Arabia as the Emirate of Transjordan and on 15 May 1923 recognized it as a state, thereby eliminating Jewish national aspirations on that part of Palestine. Under the Mandate, Jewish immigration to Palestine increased substantially with a rise in Jewish nationalism, which encouraged Zionism, a return to the ancient land of the Jews. Arab leaders, particularly the Grand Mufti of Jerusalem (Haj Muhammed Amin al-Husseini), strongly opposed Jewish immigration and employed anti-Semitic demagogery claiming that Jews threatened the Haram. The result was, in 1920, 1922 and 1929, the 1920 Palestine riots. In 1936, the British Peel Commission advised that the western part of Palestine be divided between Arabs and Jews. The Arabs then launched the Great Uprising against British rule in an effort to end the immigration. The Jews organized militia groups like the Irgun and Lehi to fight the British and the Haganah and Palmach to fight the Arabs. By the time order was restored in March 1939, more than 5,000 Arabs, 400 Jews, and 200 Britons had been killed. Full name with titles: Field Marshal Edmund Henry Hynman Allenby, 1st Viscount Allenby. Allenby was sent to Egypt to be made commander-in-chief of the Egyptian Expeditionary Force (EEF) on 27 June, 1917, replacing Sir Archibald Murray. Allenby quickly won the respect of his men by making frequent visits to front line troops. Later he became High Commissioner in Egypt from 07 Oct 1919 to 15 Jun 1925. Full name: John Standish Surtees Prendergast Vereker, Viscount Gort. Independence from Britain as State of Israel as a Jewish State. The situation as regards currency in the British territories in the Middle East was quite different from the situation as regards the currencies of the British West Indies. East Africa and the Middle East were late additions to the British Empire, and by that time, the British government had already learned from experience in Canada, India, and Hong Kong, that it is highly impractical to impose a new currency in the place of already existing practices. At no time in the history of Britain's involvement in the Middle East region did the sterling coinage ever form a part of the circulating currency. 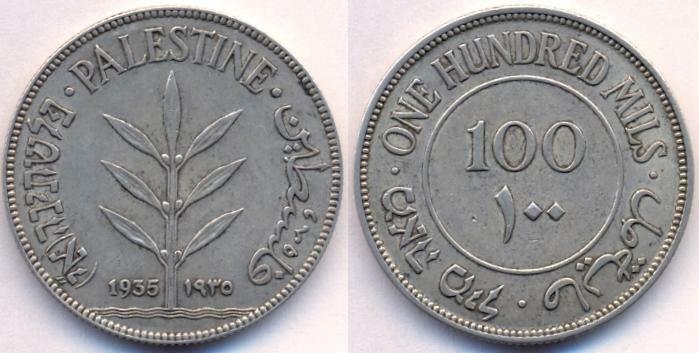 The sterling unit of account did however enter the region through Palestine in 1927, in the form of the Palestinian pound. 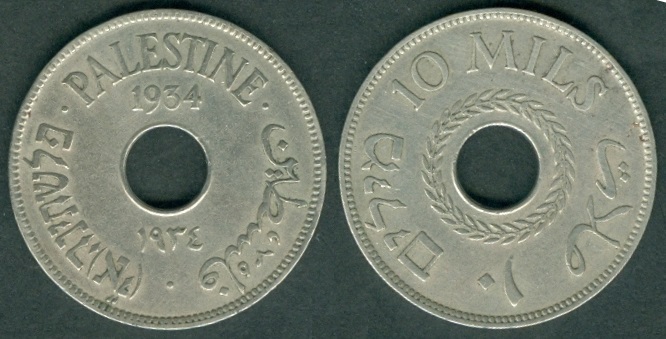 The Palestinian pound was introduced into Palestine in 1927 to end the confusion which had arisen as a result of the twin circulation of Turkish and Egyptian money in the territory. 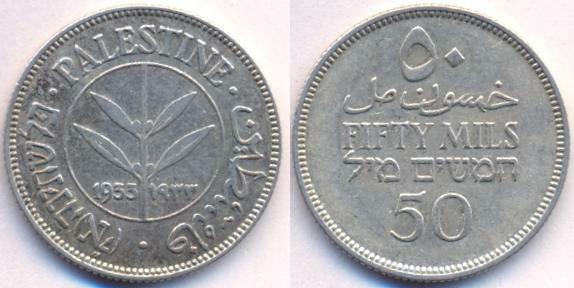 The Palestinian pound was created at par with the pound sterling, but it was not used in conjunction with the pounds, shillings, and pence coinage. It was used in conjunction with a decimal system. 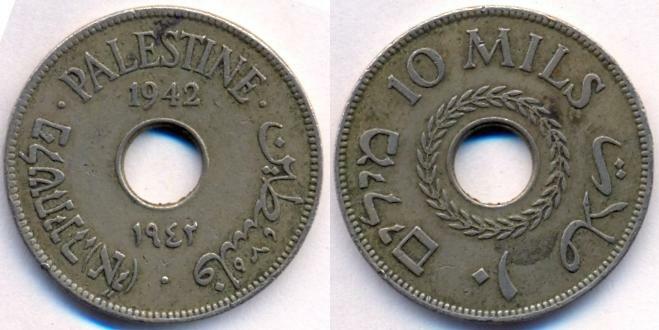 The Palestine Currency Board was appointed in 1926 by the British Secretary of State for the Colonies, and was in charge of the introduction and control of currency in Palestine under the British Mandate. The activities of the this board, completely independent of local government, were confined to the issue of currency banknotes which were backed by an equivalent amount of Pound Sterling in London. 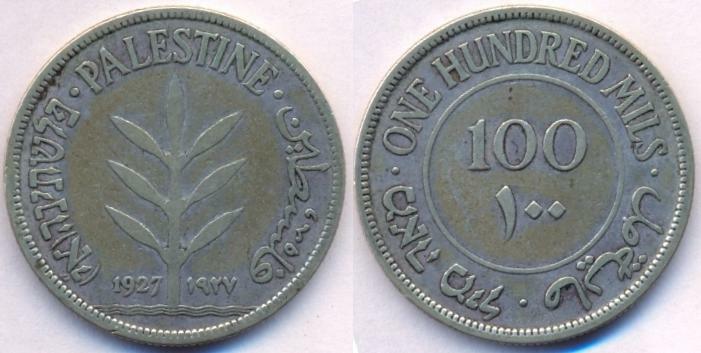 On February 7, 1927, The Palestine Currency Order created the Palestine pound which was divided into 1000 mils. 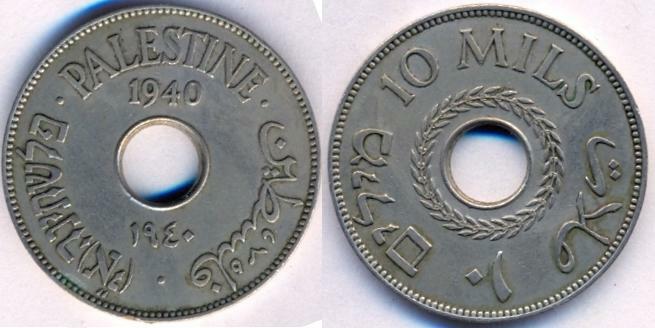 In 1927, The Palestine Currency Board, after consulting with the Mandatory government officials, decided that the coins should be in the denominations of 1, 2, 5, 10, 20, 50 and 100 mils. The 1 and 2 mils were struck in bronze, whilst the 5, 10 and 20 mils were holed, copper-nickel coins, except for during World War II, when they were also minted in bronze. The 50 and 100 mils coins were struck in .720 silver and .280 copper with reeded/milled edge. Although a gold coin equal to £1 was provided for in the Currency Order but were ever minted. All the denominations were trilingual in Arabic, English and Hebrew [though the Hebrew inscription includes the initials Alef Yud after "Palestina", for "Eretz Yisrael" (Land of Israel)]. The Arab leadership saw this compromise as a violation of the mandate terms, but would not stop it. The last coins were issued for circulation in 1946, with all 1947 dated coins being melted down. 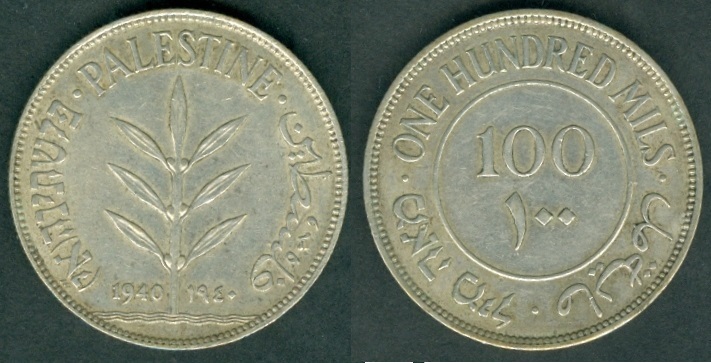 From their initial introduction on the eve on the tenth anniversary of the Balfour Declaration (November 1, 1927), the coins were minted as needed to meet public demands. Unlike the United States for example, coins were not struck with all the possible year dates from 1927 to the termination of the Mandate in 1948. In all, there were 59 different combinations of dates and denominations comprising the entire range of regularly issued coinage. The 1947-dated coins, which were not officially released for circulation, are not part of the total number accepted by collectors as to what constitutes a complete set of coins. 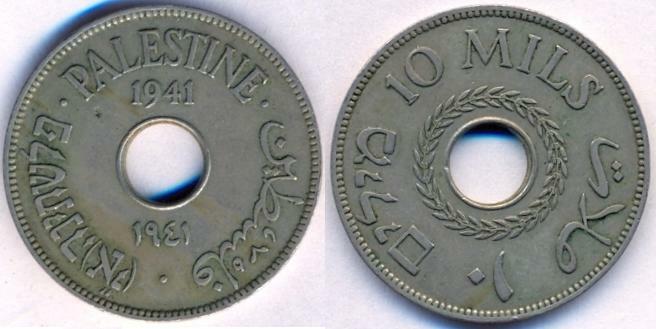 After the termination of the Palestine Mandate and the creation of the State of Israel on May 14, 1948, the coins issued by the Palestine Currency Board remained legal tender in Israel until September 15, 1948; in the Gaza Strip region of Egypt until June 9, 1951; and in Jordan until June 30, 1951. Beyond these dates, the coins were demonetized. KM#1 Mil. Year: 1927. Weight: 3.20g. Metal: Bronze. Diameter: 21 mm. Edge: Plain. Alignment: Medal. Mint: British Royal Mint. Obverse Legends: Inscription PALESTINE in Arabic, English and Hebrew. Reverse legends: Value and Olive stem. Mintage: 10,000,000 + 66 Proof. Mintage Years: 1927, 1935, 1937, 1939-1944, 1946 and 1947. KM#2 2 Mils. Year: 1927. Weight: 7.80g. Metal: Bronze. Diameter: 28 mm. Edge: Plain. Alignment: Medal. Mint: British Royal Mint. Obverse Legends: Inscription PALESTINE in Arabic, English and Hebrew. Reverse legends: Value and Olive stem. Mintage: 5,000,000 + 66 Proof. Mintage Years: 1927, 1941, 1942 and 1945-1947. KM#3 5 Mils. Year: 1927. Weight: 2.90g. Metal: Copper-Nickel. Diameter: 20 mm. Edge: Plain. Alignment: Medal. Mint: British Royal Mint. Obverse Legends: Wreath around center hole, inscription PALESTINE in Arabic, English and Hebrew. Reverse legends: Value. Mintage: 10,000,000 + 66 Proof. Mintage Years: 1927, 1934, 1935, 1939, 1946 and 1947. KM#4 10 Mils. Year: 1927. Weight: 6.50g. Metal: Copper-Nickel. Diameter: 27 mm. Edge: Plain. Alignment: Medal. Mint: British Royal Mint. 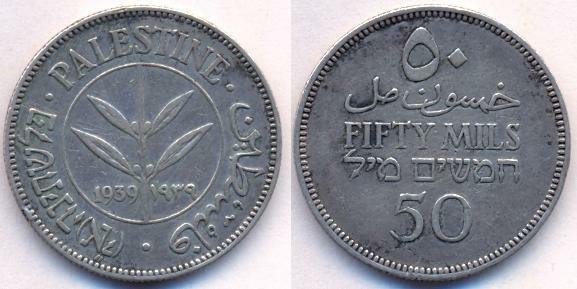 Obverse Legends: Inscription PALESTINE in Arabic, English and Hebrew. Reverse legends: Wreath around center hole, Value. Mintage: 5,000,000. Mintage Years: 1927, 1933-1935, 1937, 1939-1942 and 1946-1947. KM#5 20 Mils. Year: 1927. Weight: 11.30g. Metal: Copper-Nickel. Diameter: 30.5 mm. Edge: Plain. Alignment: Medal. Mint: British Royal Mint. Obverse Legends: Wreath around center hole, inscription PALESTINE in Arabic, English and Hebrew. Reverse legends: Value. Mintage: 1,500,000. Mintage Years: 1927, 1933-1935 and 1940-1941. KM#6 50 Mils. Year: 1927. Weight: 5.8319g. Metal: 0.720 Silver. Diameter: 23.5 mm. Edge: Reeded. Alignment: Medal. Mint: British Royal Mint. 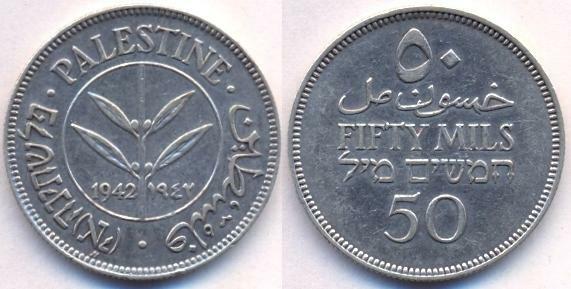 Obverse Legends: Olive stem within circle, inscription PALESTINE in Arabic, English and Hebrew. Reverse legends: Written and numeric value. Mintage: 8,000,000. Mintage Years: 1927, 1931, 1933-1935, 1939-1940 and 1942. KM#7 100 Mils. Year: 1927. Weight: 11.6638g. Metal: 0.720 Silver. Diameter: 29 mm. Edge: Reeded. Alignment: Medal. Mint: British Royal Mint. Obverse Legends: Olive stem, inscription PALESTINE in Arabic, English and Hebrew. Reverse legends: Written and numeric value. Mintage: 2,000,000. Mintage Years: 1927, 1931, 1933-1935, 1939-1940 and 1942. KM#6 50 Mils. Year: 1931. Weight: 5.8319g. Metal: 0.720 Silver. Diameter: 23.5 mm. Edge: Reeded. Alignment: Medal. Mint: British Royal Mint. 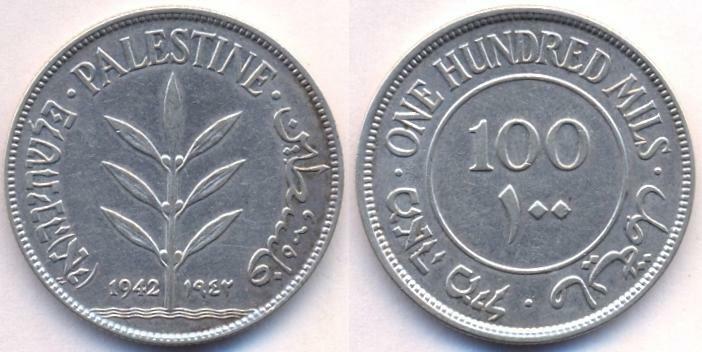 Obverse Legends: Olive stem within circle, inscription PALESTINE in Arabic, English and Hebrew. Reverse legends: Written and numeric value. Mintage: 500,000. Mintage Years: 1927, 1931, 1933-1935, 1939-1940 and 1942. KM#7 100 Mils. Year: 1931. Weight: 11.6638g. Metal: 0.720 Silver. Diameter: 29 mm. Edge: Reeded. Alignment: Medal. Mint: British Royal Mint. 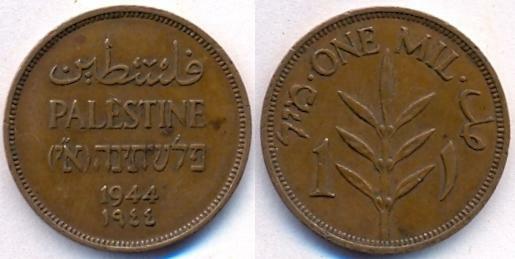 Obverse Legends: Olive stem within circle, inscription PALESTINE in Arabic, English and Hebrew. Reverse legends: Written and numeric value. Mintage: 250,000. Mintage Years: 1927, 1931, 1933-1935, 1939-1940 and 1942. KM#4 10 Mils. Year: 1933. Weight: 6.50g. Metal: Copper-Nickel. Diameter: 27 mm. Edge: Plain. Alignment: Medal. Mint: British Royal Mint. Obverse Legends: Inscription PALESTINE in Arabic, English and Hebrew. Reverse legends: Wreath around center hole, Value. Mintage: 500,000. Mintage Years: 1927, 1933-1935, 1937, 1939-1942 and 1946-1947. KM#5 20 Mils. Year: 1933. Weight: 11.30g. Metal: Copper-Nickel. Diameter: 30.5 mm. Edge: Plain. Alignment: Medal. Mint: British Royal Mint. 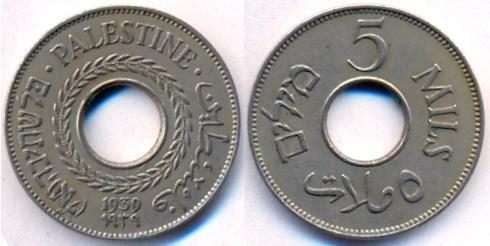 Obverse Legends: Wreath around center hole, inscription PALESTINE in Arabic, English and Hebrew. Reverse legends: Value. Mintage: 250,000. Mintage Years: 1927, 1933-1935 and 1940-1941. KM#6 50 Mils. Year: 1933. Weight: 5.8319g. Metal: 0.720 Silver. Diameter: 23.5 mm. Edge: Reeded. Alignment: Medal. Mint: British Royal Mint. 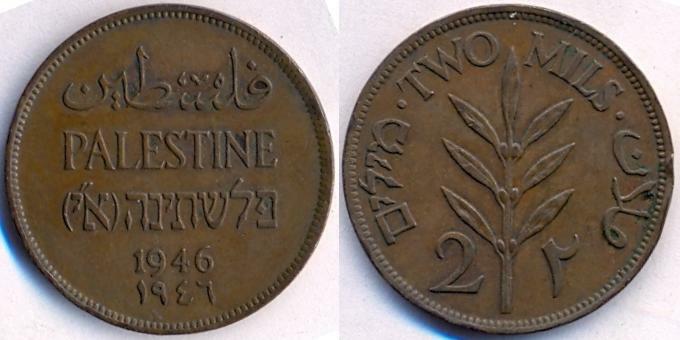 Obverse Legends: Olive stem within circle, inscription PALESTINE in Arabic, English and Hebrew. Reverse legends: Written and numeric value. Mintage: 1,000,000. Mintage Years: 1927, 1931, 1933-1935, 1939-1940 and 1942. KM#7 100 Mils. Year: 1933. Weight: 11.6638g. Metal: 0.720 Silver. Diameter: 29 mm. Edge: Reeded. Alignment: Medal. Mint: British Royal Mint. 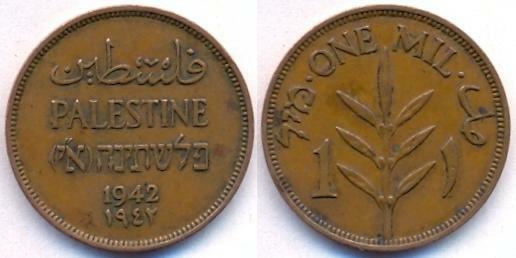 Obverse Legends: Olive stem within circle, inscription PALESTINE in Arabic, English and Hebrew. Reverse legends: Written and numeric value. Mintage: 500,000. Mintage Years: 1927, 1931, 1933-1935, 1939-1940 and 1942. KM#3 5 Mils. Year: 1934. Weight: 2.90g. Metal: Copper-Nickel. Diameter: 20 mm. Edge: Plain. Alignment: Medal. Mint: British Royal Mint. 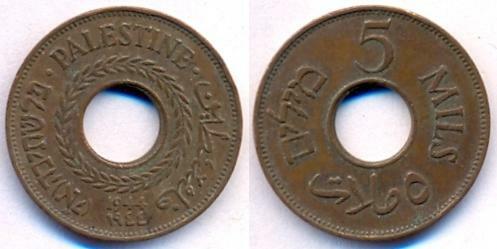 Obverse Legends: Wreath around center hole, inscription PALESTINE in Arabic, English and Hebrew. Reverse legends: Value. Mintage: 500,000. Mintage Years: 1927, 1934, 1935, 1939, 1946 and 1947. KM#4 10 Mils. Year: 1934. Weight: 6.37g. Metal: Copper-Nickel. Diameter: 27 mm. Edge: Plain. Alignment: Medal. Mint: British Royal Mint. Obverse Legends: Inscription PALESTINE in Arabic, English and Hebrew. Reverse legends: Wreath around center hole, Value. Mintage: 500,000. Mintage Years: 1927, 1933-1935, 1937, 1939-1942 and 1946-1947. KM#5 20 Mils. Year: 1934. Weight: 11.30g. Metal: Copper-Nickel. Diameter: 30.5 mm. Edge: Plain. Alignment: Medal. Mint: British Royal Mint. 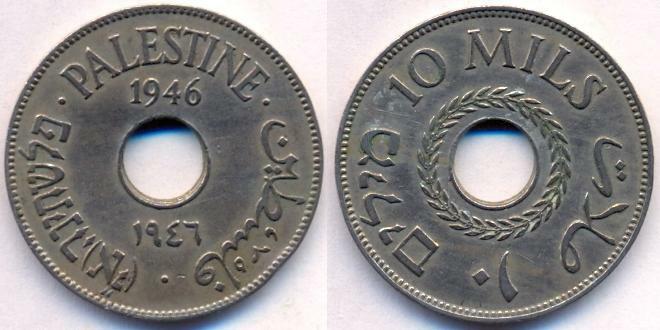 Obverse Legends: Wreath around center hole, inscription PALESTINE in Arabic, English and Hebrew. Reverse legends: Value. Mintage: 125,000. Mintage Years: 1927, 1933-1935 and 1940-1941. KM#6 50 Mils. Year: 1934. Weight: 5.8319g. Metal: 0.720 silver. Diameter: 23.5 mm. Edge: Reeded. Alignment: Medal. Mint: British Royal Mint. 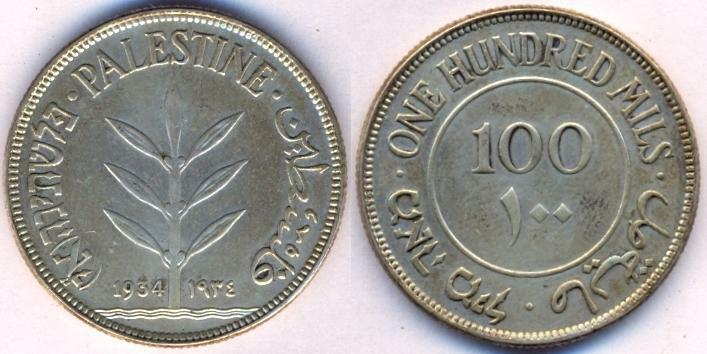 Obverse Legends: Olive stem within circle, inscription PALESTINE in Arabic, English and Hebrew. Reverse legends: Written and numeric value. Mintage: 398,861. Mintage Years: 1927, 1931, 1933-1935, 1939-1940 and 1942. KM#7 100 Mils. Year: 1934. Weight: 11.6638g. Metal: 0.720 silver. Diameter: 29 mm. Edge: Reeded. Alignment: Medal. Mint: British Royal Mint. Obverse Legends: Olive stem, inscription PALin Arabic, English and Hebrew. Reverse legends: Written and numeric value. Mintage: 200,000. Mintage Years: 1927, 1931, 1933-1935, 1939-1940 and 1942. Scarce coin due to low mintage. KM#1 Mil. Year: 1935. Weight: 3.20g. Metal: Bronze. Diameter: 21 mm. Edge: Plain. Alignment: Medal. Mint: British Royal Mint. Obverse Legends: Inscription PALESTINE in Arabic, English and Hebrew. Reverse legends: Value and Olive stem. Mintage: 704,000. Mintage Years: 1927, 1935, 1937, 1939-1944, 1946 and 1947. KM#3 5 Mils. Year: 1935. Weight: 2.90g. Metal: Copper-Nickel. Diameter: 20 mm. Edge: Plain. Alignment: Medal. Mint: British Royal Mint. 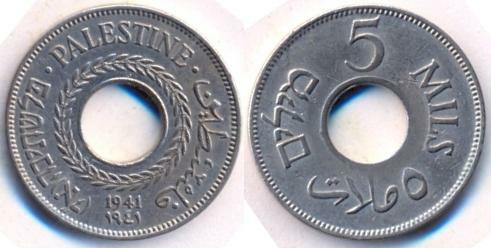 Obverse Legends: Wreath around center hole, inscription PALESTINE in Arabic, English and Hebrew. Reverse legends: Value. Mintage: 2,700,000. Mintage Years: 1927, 1934, 1935, 1939, 1946 and 1947. KM#4 10 Mils. Year: 1935. Weight: 6.50g. Metal: Copper-Nickel. Diameter: 27 mm. Edge: Plain. Alignment: Medal. Mint: British Royal Mint. Obverse Legends: Inscription PALESTINE in Arabic, English and Hebrew. Reverse legends: Wreath around center hole, Value. Mintage: 1,150,000. Mintage Years: 1927, 1933-1935, 1937, 1939-1942 and 1946-1947. KM#5 20 Mils. Year: 1935. Weight: 11.30g. Metal: Copper-Nickel. Diameter: 30.5 mm. Edge: Plain. Alignment: Medal. Mint: British Royal Mint. Obverse Legends: Wreath around center hole, inscription PALESTINE in Arabic, English and Hebrew. Reverse legends: Value. Mintage: 575,000. Mintage Years: 1927, 1933-1935 and 1940-1941. KM#6 50 Mils. Year: 1935. Weight: 5.8319g. Metal: 0.720 Silver. Diameter: 23.5 mm. Edge: Reeded. Alignment: Medal. Mint: British Royal Mint. 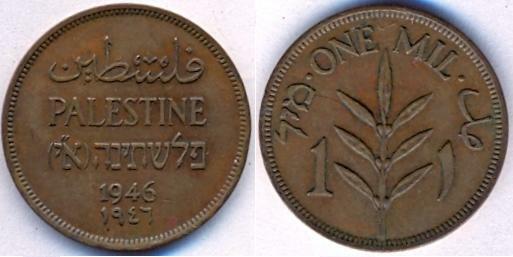 Obverse Legends: Olive stem within circle, inscription PALESTINE in Arabic, English and Hebrew. Reverse legends: Written and numeric value. Mintage: 5,600,000. Mintage Years: 1927, 1931, 1933-1935, 1939-1940 and 1942. KM#7 100 Mils. Year: 1935. Weight: 11.6638g. Metal: 0.720 Silver. Diameter: 29 mm. Edge: Reeded. Alignment: Medal. Mint: British Royal Mint. Obverse Legends: Olive stem, inscription PALin Arabic, English and Hebrew. Reverse legends: Written and numeric value. Mintage: 2,850,000. Mintage Years: 1927, 1931, 1933-1935, 1939-1940 and 1942. KM#1 Mil. Year: 1937. Weight: 3.20g. Metal: Bronze. Diameter: 21 mm. Edge: Plain. Alignment: Medal. Mint: British Royal Mint. 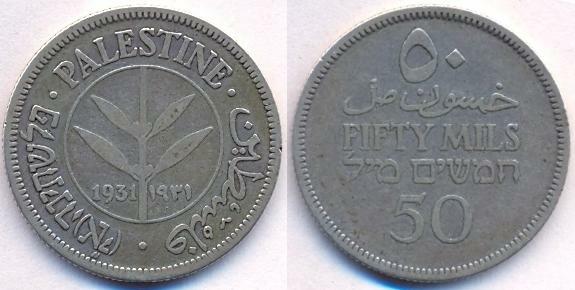 Obverse Legends: Inscription PALESTINE in Arabic, English and Hebrew. Reverse legends: Value and Olive stem. Mintage: 1,200,000. Mintage Years: 1927, 1935, 1937, 1939-1944, 1946 and 1947. KM#4 10 Mils. Year: 1937. Weight: 6.50g. Metal: Copper-Nickel. Diameter: 27 mm. Edge: Plain. Alignment: Medal. Mint: British Royal Mint. Obverse Legends: Inscription PALESTINE in Arabic, English and Hebrew. Reverse legends: Wreath around center hole, Value. Mintage: 750,000. Mintage Years: 1927, 1933-1935, 1937, 1939-1942 and 1946-1947. KM#1 Mil. Year: 1939. Weight: 3.20g. Metal: Bronze. Diameter: 21 mm. Edge: Plain. Alignment: Medal. Mint: British Royal Mint. 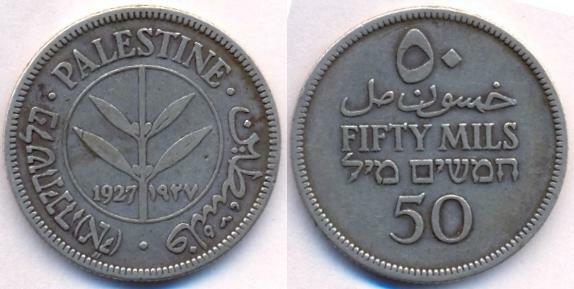 Obverse Legends: Inscription PALESTINE in Arabic, English and Hebrew. Reverse legends: Value and Olive stem. Mintage: 3,700,000. Mintage Years: 1927, 1935, 1937, 1939-1944, 1946 and 1947. KM#3 5 Mils. Year: 1939. Weight: 2.90g. Metal: Copper-Nickel. Diameter: 20 mm. Edge: Plain. Alignment: Medal. Mint: British Royal Mint. Obverse Legends: Wreath around center hole, inscription PALESTINE in Arabic, English and Hebrew. Reverse legends: Value. Mintage: 2,000,000. Mintage Years: 1927, 1934, 1935, 1939, 1946 and 1947. KM#4 10 Mils. Year: 1939. Weight: 6.50g. Metal: Copper-Nickel. Diameter: 27 mm. Edge: Plain. Alignment: Medal. Mint: British Royal Mint. Obverse Legends: Inscription PALESTINE in Arabic, English and Hebrew. Reverse legends: Wreath around center hole, Value. Mintage: 1,000,000. Mintage Years: 1927, 1933-1935, 1937, 1939-1942 and 1946-1947. KM#6 50 Mils. Year: 1939. Weight: 5.8319g. Metal: 0.720 Silver. Diameter: 23.5 mm. Edge: Reeded. Alignment: Medal. Mint: British Royal Mint. 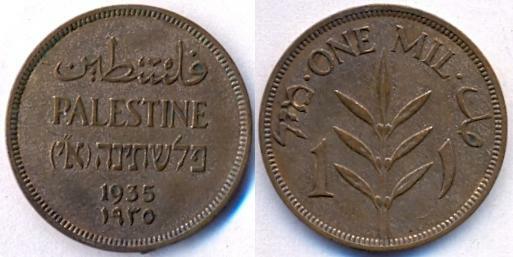 Obverse Legends: Olive stem within circle, inscription PALESTINE in Arabic, English and Hebrew. Reverse legends: Written and numeric value. Mintage: 3,000,000. Mintage Years: 1927, 1931, 1933-1935, 1939-1940 and 1942. KM#7 100 Mils. Year: 1939. Weight: 11.6638g. Metal: 0.720 Silver. Diameter: 29 mm. Edge: Reeded. Alignment: Medal. Mint: British Royal Mint. Obverse Legends: Olive stem, inscription PALESTINE in Arabic, English and Hebrew. Reverse legends: Written and numeric value. Mintage: 1,500,000. Mintage Years: 1927, 1931, 1933-1935, 1939-1940 and 1942. KM#1 Mil. Year: 1940. Weight: 3.20g. Metal: Bronze. Diameter: 21 mm. Edge: Plain. Alignment: Medal. Mint: British Royal Mint. Obverse Legends: Inscription PALESTINE in Arabic, English and Hebrew. Reverse legends: Value and Olive stem. Mintage: 396,000. Mintage Years: 1927, 1935, 1937, 1939-1944, 1946 and 1947. KM#4 10 Mils. Year: 1940. Weight: 6.50g. Metal: Copper-Nickel. Diameter: 27 mm. Edge: Plain. Alignment: Medal. Mint: British Royal Mint. Obverse Legends: Inscription PALESTINE in Arabic, English and Hebrew. Reverse legends: Wreath around center hole, Value. Mintage: 1,500,000. Mintage Years: 1927, 1933-1935, 1937, 1939-1942 and 1946-1947. KM#5 20 Mils. Year: 1940. Weight: 11.30g. Metal: Copper-Nickel. Diameter: 30.5 mm. Edge: Plain. Alignment: Medal. Mint: British Royal Mint. Obverse Legends: Wreath around center hole, inscription PALESTINE in Arabic, English and Hebrew. Reverse legends: Value. Mintage: 200,000. Mintage Years: 1927, 1933-1935 and 1940-1941. KM#6 50 Mils. Year: 1940. Weight: 5.8319g. Metal: 0.720 Silver. Diameter: 23.5 mm. Edge: Reeded. Alignment: Medal. Mint: British Royal Mint. 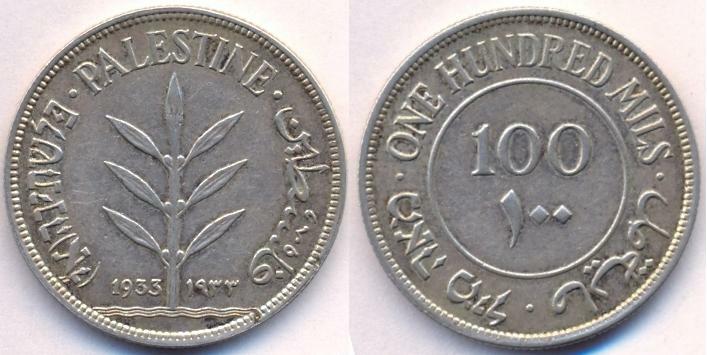 Obverse Legends: Olive stem within circle, inscription PALESTINE in Arabic, English and Hebrew. Reverse legends: Written and numeric value. Mintage: 2,000,000. Mintage Years: 1927, 1931, 1933-1935, 1939-1940 and 1942. KM#7 100 Mils. Year: 1940. Weight: 11.59g [11.6638g]. Metal: 0.720 Silver. Diameter: 29 mm. Edge: Reeded. Alignment: Medal. Mint: British Royal Mint. Obverse Legends: Olive stem, inscription PALESTINE in Arabic, English and Hebrew. Reverse legends: Written and numeric value. Mintage: 1,000,000. Mintage Years: 1927, 1931, 1933-1935, 1939-1940 and 1942. KM#1 Mil. Year: 1941. Weight: 3.20g. Metal: Bronze. Diameter: 21 mm. Edge: Plain. Alignment: Medal. Mint: British Royal Mint. Obverse Legends: Inscription PALESTINE in Arabic, English and Hebrew. Reverse legends: Value and Olive stem. Mintage: 1,920,000. Mintage Years: 1927, 1935, 1937, 1939-1944, 1946 and 1947. KM#2 2 Mils. Year: 1941. Weight: 7.80g. Metal: Bronze. Diameter: 28 mm. Edge: Plain. Alignment: Medal. Mint: British Royal Mint. Obverse Legends: Inscription PALESTINE in Arabic, English and Hebrew. Reverse legends: Value and Olive stem. Mintage: 1,600,000. Mintage Years: 1927, 1941, 1942 and 1945-1947. KM#3 5 Mils. Year: 1941. Weight: 2.90g. Metal: Copper-Nickel. Diameter: 20 mm. Edge: Plain. Alignment: Medal. Mint: British Royal Mint. Obverse Legends: Wreath around center hole, inscription PALESTINE in Arabic, English and Hebrew. Reverse legends: Value. Mintage: 400,000. Mintage Years: 1927, 1934, 1935, 1939, 1946 and 1947. KM#4 10 Mils. Year: 1941. Weight: 6.50g. Metal: Copper-Nickel. Diameter: 27 mm. Edge: Plain. Alignment: Medal. Mint: British Royal Mint. Obverse Legends: Inscription PALESTINE in Arabic, English and Hebrew. Reverse legends: Wreath around center hole, Value. Mintage: 400,000. Mintage Years: 1927, 1933-1935, 1937, 1939-1942 and 1946-1947. KM#5 20 Mils. Year: 1941. Weight: 11.30g. Metal: Copper-Nickel. Diameter: 30.5 mm. Edge: Plain. Alignment: Medal. Mint: British Royal Mint. Obverse Legends: Wreath around center hole, inscription PALESTINE in Arabic, English and Hebrew. Reverse legends: Value. Mintage: 100,000. Mintage Years: 1927, 1933-1935 and 1940-1941. KM#1 Mil. Year: 1942. Weight: 3.20g. Metal: Bronze. Diameter: 21 mm. Edge: Plain. Alignment: Medal. Mint: British Royal Mint. Obverse Legends: Inscription PALESTINE in Arabic, English and Hebrew. Reverse legends: Value and Olive stem. Mintage: 4,480,000. Mintage Years: 1927, 1935, 1937, 1939-1944, 1946 and 1947. KM#2 2 Mils. Year: 1942. Weight: 7.80g. Metal: Bronze. Diameter: 28 mm. Edge: Plain. Alignment: Medal. Mint: British Royal Mint. Obverse Legends: Inscription PALESTINE in Arabic, English and Hebrew. Reverse legends: Value and Olive stem. Mintage: 2,400,000. Mintage Years: 1927, 1941, 1942 and 1945-1947. KM#3a 5 Mils. Year: 1942. Weight: 2.90g. Metal: Bronze. Diameter: 20 mm. Edge: Plain. Alignment: Medal. Mint: British Royal Mint. Obverse Legends: Wreath around center hole, inscription PALESTINE in Arabic, English and Hebrew. Reverse legends: Value. Mintage: 2,700,000. Mintage Years: 1942 and 1944. KM#4 10 Mils. Year: 1942. Weight: 6.50g. Metal: Copper-Nickel. Diameter: 27 mm. Edge: Plain. Alignment: Medal. Mint: British Royal Mint. 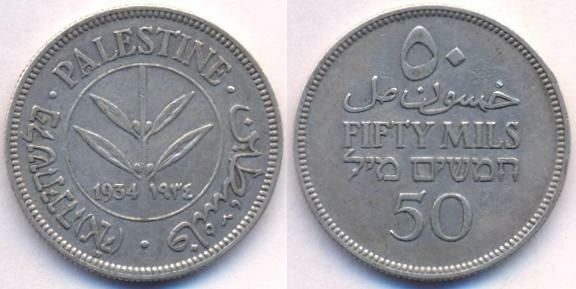 Obverse Legends: Inscription PALESTINE in Arabic, English and Hebrew. Reverse legends: Wreath around center hole, Value. Mintage: 600,000. Mintage Years: 1927, 1933-1935, 1937, 1939-1942 and 1946-1947. KM#4a 10 Mils. Year: 1942. Weight: 6.50g. Metal: Bronze. Diameter: 27 mm. Edge: Plain. Alignment: Medal. Mint: British Royal Mint. Obverse Legends: Inscription PALESTINE in Arabic, English and Hebrew. Reverse legends: Wreath around center hole, Value. Mintage: 1,000,000. Mintage Years: 1942 and 1943. KM#5a 20 Mils. Year: 1942. Weight: 11.30g. Metal: Bronze. Diameter: 30.5 mm. Edge: Plain. Alignment: Medal. Mint: British Royal Mint. 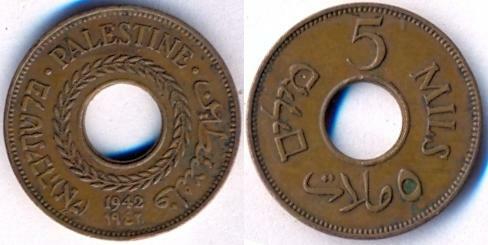 Obverse Legends: Wreath around center hole, inscription PALESTINE in Arabic, English and Hebrew. Reverse legends: Value. Mintage: 1,100,000. Mintage Years: 1942 and 1944. KM#6 50 Mils. Year: 1942. Weight: 5.8319g. Metal: 0.720 Silver. Diameter: 23.5 mm. Edge: Reeded. Alignment: Medal. Mint: British Royal Mint. 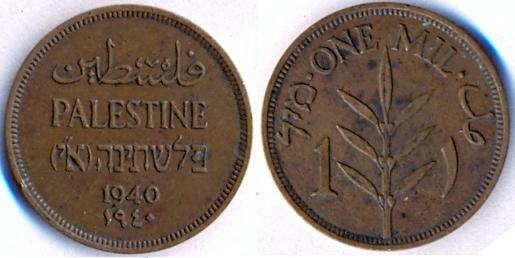 Obverse Legends: Olive stem within circle, inscription PALESTINE in Arabic, English and Hebrew. Reverse legends: Written and numeric value. Mintage: 5,000,000. Mintage Years: 1927, 1931, 1933-1935, 1939-1940 and 1942. KM#7 100 Mils. Year: 1942. Weight: 11.6638g. Metal: 0.720 Silver. Diameter: 29 mm. Edge: Reeded. Alignment: Medal. Mint: British Royal Mint. Obverse Legends: Olive stem, inscription PALESTINE in Arabic, English and Hebrew. Reverse legends: Written and numeric value. Mintage: 2,500,000. Mintage Years: 1927, 1931, 1933-1935, 1939-1940 and 1942. KM#1 Mil. Year: 1943. Weight: 3.20g. Metal: Bronze. Diameter: 21 mm. Edge: Plain. Alignment: Medal. Mint: British Royal Mint. Obverse Legends: Inscription PALESTINE in Arabic, English and Hebrew. Reverse legends: Value and Olive stem. Mintage: 2,800,000. Mintage Years: 1927, 1935, 1937, 1939-1944, 1946 and 1947. KM#4a 10 Mils. Year: 1943. Weight: 6.50g. Metal: Bronze. Diameter: 27 mm. Edge: Plain. Alignment: Medal. Mint: British Royal Mint. Obverse Legends: Inscription PALESTINE in Arabic, English and Hebrew. Reverse legends: Wreath around center hole, Value. Mintage: 1,000,000. Mintage Years: 1942 and 1943. KM#1 Mil. Year: 1944. Weight: 3.20g. Metal: Bronze. Diameter: 21 mm. Edge: Plain. Alignment: Medal. Mint: British Royal Mint. Obverse Legends: Inscription PALESTINE in Arabic, English and Hebrew. Reverse legends: Value and Olive stem. Mintage: 1,400,000. Mintage Years: 1927, 1935, 1937, 1939-1944, 1946 and 1947. KM#3a 5 Mils. Year: 1944. Weight: 2.90g. Metal: Bronze. Diameter: 20 mm. Edge: Plain. Alignment: Medal. Mint: British Royal Mint. Obverse Legends: Wreath around center hole, inscription PALESTINE in Arabic, English and Hebrew. Reverse legends: Value. Mintage: 1,000,000. Mintage Years: 1942 and 1944. KM#5a 20 Mils. Year: 1944. Weight: 11.30g. Metal: Bronze. Diameter: 30.5 mm. Edge: Plain. Alignment: Medal. Mint: British Royal Mint. 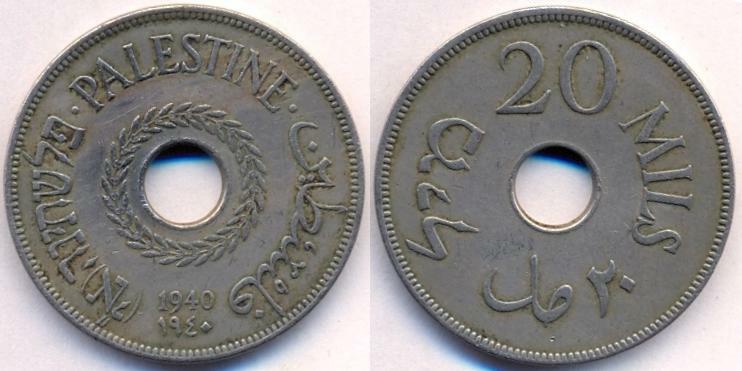 Obverse Legends: Wreath around center hole, inscription PALESTINE in Arabic, English and Hebrew. Reverse legends: Value. Mintage: 1,000,000. Mintage Years: 1942 and 1944. KM#2 2 Mils. Year: 1945. Weight: 7.80g. Metal: Bronze. Diameter: 28 mm. Edge: Plain. Alignment: Medal. Mint: British Royal Mint. Obverse Legends: Inscription PALESTINE in Arabic, English and Hebrew. Reverse legends: Value and Olive stem. Mintage: 960,000. Mintage Years: 1927, 1941, 1942 and 1945-1947. 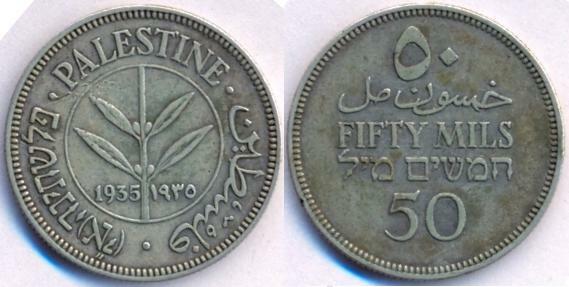 This is the only Palestine coin minted in 1945. KM#1 Mil. Year: 1946. Weight: 3.20g. Metal: Bronze. Diameter: 21 mm. Edge: Plain. Alignment: Medal. Mint: British Royal Mint. Obverse Legends: Inscription PALESTINE in Arabic, English and Hebrew. Reverse legends: Value and Olive stem. Mintage: 1,632,000. Mintage Years: 1927, 1935, 1937, 1939-1944, 1946 and 1947. KM#2 2 Mils. Year: 1946. Weight: 7.80g. Metal: Bronze. Diameter: 28 mm. Edge: Plain. Alignment: Medal. Mint: British Royal Mint. Obverse Legends: Inscription PALESTINE in Arabic, English and Hebrew. Reverse legends: Value and Olive stem. Mintage: 960,000. Mintage Years: 1927, 1941, 1942 and 1945-1947. KM#3 5 Mils. Year: 1946. Weight: 2.90g. Metal: Copper-Nickel. Diameter: 20 mm. Edge: Plain. Alignment: Medal. Mint: British Royal Mint. 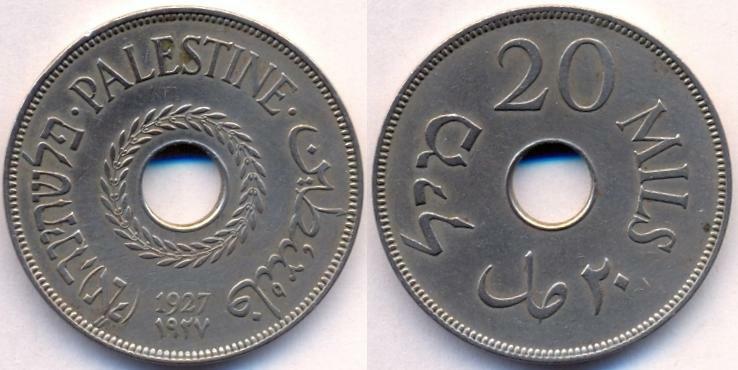 Obverse Legends: Wreath around center hole, inscription PALESTINE in Arabic, English and Hebrew. Reverse legends: Value. Mintage: 1,000,000. Mintage Years: 1927, 1934, 1935, 1939, 1946 and 1947. KM#4 10 Mils. Year: 1946. Weight: 6.50g. Metal: Copper-Nickel. Diameter: 27 mm. Edge: Plain. Alignment: Medal. Mint: British Royal Mint. Obverse Legends: Inscription PALESTINE in Arabic, English and Hebrew. Reverse legends: Wreath around center hole, Value. Mintage: 1,000,000. Mintage Years: 1927, 1933-1935, 1937, 1939-1942 and 1946-1947. The entire 1947 coins were melted. From 1947, 5 pieces from 1 mil (Mintage: 2,880,000), 1 piece from 2 mils (Mintage: 480,000), 3 pieces from 5 mils CuNi (Mintage: 1,000,000), 1 piece from 10 mils CuNi (Mintage: 1,000,000) are known, mostly with British Museum. 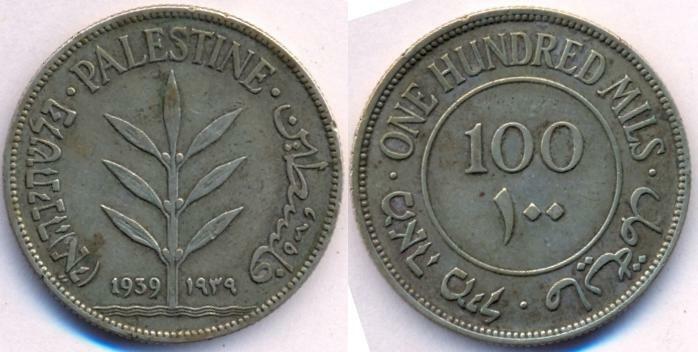 Note: The three missing coins in my Palestine collection are currently; 20 mils 1934 (Mintage: 125,000), 20 mils 1941 (Mintage: 100,000) and 100 mils 1931 (Mintage: 250,000). Soon after World War II, the British decided to leave Palestine. The United Nations attempted to solve the dispute by putting forward the 1947 UN Partition Plan, which divided the British Mandate of Palestine between the Arab and Jewish populations. On November 29, 1947, the Jewish Agency, including the Palestinian Jews, accepted the plan as it would help lead to the establishment of a new Zion, while the Arab states rejected it in protest of the establishment of any independent homeland for Jewish residents of the Middle East (apparently since many Palestinians would thus lose their own land in the process), refusing an independent Arab state in an all-or-nothing campaign. On May 14, 1948, the Jewish population declared independence as the State of Israel. A war, called the War of Independence by Israelis and the Nakba by Palestinians, began. The armies of Egypt, Iraq, Jordan, Lebanon, and Syria declared war on the newly formed state of Israel and invaded, but did not succeed in conquering Israel (1948 Arab-Israeli War). During the fighting, additional Arabs fled and in some locations were expelled. What remained of the territories allotted to the Arab state in Israel was annexed by Jordan (Judea and Samaria/the West Bank) or occupied by Egypt (the Gaza Strip) from 1948 to 1967. During this time, Jordan and Egypt did not normalize living conditions or establish an independent state for Palestinian Arabs. Following military threats by Egypt and Syria, including Egyptian president Nasser's demand of the UN to remove its peace-keeping troops from the Egyptian-Israeli border, in June 1967 Israeli forces went to action against Egypt and Syria, and, after failing to persuade it to stay out of the conflict, Jordan, in what has come to be known as the Six-Day War. As a result of that war, the Israel Defense Forces conquered Judea and Samaria (the West Bank), the Gaza Strip, the Golan Heights, and the Sinai Peninsula bringing them under military rule. Israel also pushed Arab forces back from East Jerusalem, which Jews had not been permitted to visit during the prior Jordanian rule. East Jerusalem was allegedly annexed by Israel as part of its capital, though this action has not been recognized internationally. The United Nation's Security Council passed Resolution 242, promoting the "land for peace" formula, which called for Israeli withdrawal from territories occupied in 1967, in return for the end of all states of belligerency by the aforementioned Arab League nations. Since that time, Israel continued to build settlements over Palestinian land, demolishing homes and expelling families by force. Palestinians started to make their armed groups similar to the Haganah forces to attack these settlements. They continued longstanding demands for the destruction of Israel or made a new demand for self-determination in a separate independent Arab state in the West Bank and Gaza Strip similar to but smaller than the original Partition area which Palestinians and the Arab League had rejected for statehood in 1947. In the course of 1973 Yom Kippur War, military forces of Egypt have crossed the Suez canal and Syria to regain the Golan heights. The attacking military forces of Syria were pushed back. President Sadat Anwar Sadat after cease fire started a peace talks with the US and Israel. Israel returned the Sinai Peninsula to Egypt as part of the 1978 Camp David Peace Accords between Egypt and Israel in hopes of establishing a genuine peace. After the First attempts, the peace process in the Israeli-Palestinian conflict were made at the Madrid Conference of 1991. As the process progressed, in 1993 the Israelis allowed Chairman and President of the Palestine Liberation Organization Yassir Arafat to return to the region. Following the historic 1993 Oslo Peace Accords between Palestinians and Israel (the "Oslo Accords"), which gave the Palestinian Arabs limited self-rule in some parts of the Disputed Territories through the Palestinian Authority, and other detailed negotiations, proposals for a Palestinian state gained momentum. They were soon followed in 1994 by the Israel-Jordan Treaty of Peace. To date, efforts to resolve the conflict have ended in deadlock, and the people of the region, Jews and Arabs, are engaged in a bloody conflict, called variously the "Arab-Israeli conflict" or "Israeli-Palestinian conflict". From 1987 to 1993, the First Palestinian Intifada against Israel took place. After few years of on-and-off negotiations, the Palestinian militant groups have launched an orchestrated attack against Israel. This was known as the Al-Aqsa Intifada. The events were highlighted by Palestinian suicide bombing in Israel that killed many civilians, and by Israeli Security Forces full fledged invasions into civilian areas along with some targeted killings of Palestinian militant leaders and organizers. Israel began building a complex security barrier to block suicide bombers invading into Israel from the West Bank in 2002. Also in 2002, the Road map for peace calling for the resolution of the Israeli-Palestinian conflict was proposed by a "quartet": the United States, European Union, Russia, and United Nations. U.S. President George W. Bush in a speech on June 24, 2002 called for an independent Palestinian state living side by side with Israel in peace. Bush was the first U.S. President to explicitly call for such a Palestinian state. The Palestinian National Authority (PNA) is an autonomous national entity comprising the territories of Gaza (formerly under Egyptian sovereignty) and West Bank (formerly under Jordan sovereignty), which were occupied by the Israeli Defense Forces in Jun 1967. As provided by the Israeli-PLO Declaration of Principles signed on 13 Sep 1993 and upon the Agreement signed on 04 May 1994, the PNA was inaugurated on 05 Jul 1994 as a transitional status including Palestinian interim self-governing and a phased transfer of powers and territories (towns and areas of the West Bank). Negotiations on the permanent status, which could end in a Palestinian State, are under way. Various Palestine parties are Fatah = Harakat al-Tahrar al-Filistini (Liberation Movement of Palestine); Hamas = Harakat al-Muqawima al-Islamiyya (Islamic Resistance Movement, militant, islamist); PLO = Palestinian Liberation Organization (umbrella group for Palestinian liberation movements, includes Fatah); TWP = Third Way Party (centerist). in Gaza; from Nov 1948 in Cairo, Egypt. Full name: Abd ar-Rahman Abd ar-Rauf al-Qudwah al-Husayni. He was in exile in Jordan to Apr 1971; Lebanon 1971 - Dec 1982 and Tunis Dec 1982 - May 1994. He also become the President of the Palestinian Authority on 05 Jul 1995. Became Israeli detainee in Ramallah on 29 Mar - 01 May 2002, 5-6 Jun 2002, 20-29 Sep 2002, Jan 2003 - 29 Oct 2004; from 29 Oct 2004 in Paris, France for treatment. He died in Paris on 11 Nov 2004. He is also known as Abu Mazen and became the President on 15 Jan 2005 to 09 Jan 2009. From 09 Jan 2009 onwards, he is known as acting President of West Bank only while Aziz Duwaik becomes acting President of Gaza Strip. Mahmoud also served as the Prime Minister from 30 Apr 2003 (designated on 19 Mar 2003) to 07 Oct 2003. In dissidence recognized by Hamas; Israeli prisoner 15 Jan - 22 Jun 2009 and 19 Jan - 20 Jul 2012. Exile in Gaza; from Nov 1948 in Cairo, Egypt. He was designated on 19 Mar 2003. On June 14, 2007, President Mahmoud Abbas of Fatah [Harakat al-Tahrar al-Filistini (Liberation Movement of Palestine)] dismissed Ismail Haniyeh's government and appointed Salam Fayyad to form an emergency government. However, Haniyeh and Hamas [Harakat al-Muqawamah al-Islamiyyah (Islamic Resistance Movement] maintain that these actions were illegal and that Haniyeh is still the Prime Minister. Haniyeh still exercises de facto authority in the Gaza Strip, while Fayyad's authority is limited de facto to the West Bank. Ismail Haniyeh continues in rebellion in Gaza Strip to 02 Jun 2014. He is a Member of al-Tariq al-Thalith (TWP) political party. Salam Fayyad offers his resignation to President Mahmoud Abbas, who accepts it on 13 April 2013. President Mahmoud Abbas asks Rami Hamdallah to form a government. Hamdallah is sworn in as prime minister on 06 June 2013. Prime Minister Rami Hamdallah's government resigns on 23 June 2013 but was reappointed on 19 September 2013 (other resource: 02 June 2014). President Mahmoud Abbas asks Hamdallah to form a new government on 17 June 2015. On 28 January 2019, Rami Hamdallah offers to resign as the head of the unity government. On 29 January 2019, President Mahmoud Abbas accepts the resignation of Hamdallah's government. In 2010 Fantasy issue of State of Palestine coin set were released.